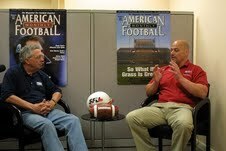 Paul Markowski has coached at both the collegiate and semi-pro levels of football. He is presently the Running Backs Coach at the United States Military Academy, working with its "sprint", aka lightweight football program. Coach Markowski is shown here with one of his players, standout Running Back Marquis Morris, a first team all-CSFL selection. Coach Markowski has been an Assistant Coach at a number of NCAA Division II Colleges, including Mansfield University in Mansfield, PA and Simon Fraser University, in Burnaby, British Columbia, Canada. In addition, he served as an assistant coach with the Charles County Lions, a semi-professional team in Waldorf, Maryland, where he ran the Pistol-Flex Triple Option. Our Guest Contributor program is one of the ways in which we are able to bring unique material to our Members and visitors. Guest Contributor information pages were introduced in late 2012. Since many of our Guest contributors now operate web sites, publish books, or produce videos, a Guest Contributor page at Option Central can be beneficial in a number of ways.